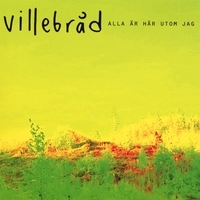 Debut album from Swedish 4 piece VILLEBRAD. Located in Uppsala, city of KAIPA, who consider themselves influenced by the classic era of progressive music alá CRIMSON, as well as the early 80's sound of JAPAN. The result is a fascination embryo that is close to Swedish sounding bands like ANEKDOTEN and LANDBERK. 9 tracks of dramatic proggressive songs with vocals in Swedish. Hopefully the listeners will enjoy as much as we do ! !